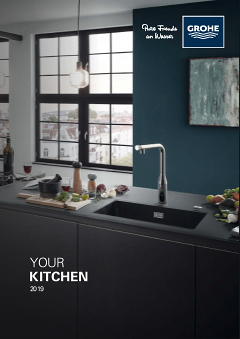 This Eurostyle Cosmopolitan range kitchen tap offers all the performance you need to get on top of kitchen chores. Fill or clean large pots easily thanks to the 360° swivel range and high spout. The handy pull-down spray head has many uses – it is ideal for rinsing the sink or prepping vegetables. The integrated GROHE SilkMove feature lets you easily vary water temperature and flow. Its distinctive lines mean this sink mixer will have a big visual impact on your kitchen. The GROHE StarLight chrome coating will retain its pristine lustre for years to come. Simple and hassle-free to install, it is the ideal kitchen all-rounder.